Decorate your home, aquarium or special event with these attractive clear colored glass flat marble table scatters by Royal Imports. These beautiful glass stones are made of high quality clear glass material so they are completely translucent and will let the light shine through. You can also use these to fill your favorite vase since these are completely submersible in water; they therefore make great vase fillers. These pretty gems will surely add an embellishing touch to your eye-catching centerpiece. These modern looking, flawless pebbles are designed to complement and enhance even the simplest event or floral arrangement. Royal Imports brings the highest quality glassware and supplies to the floral and craft industry. Each pack of flat marbles is crafted to perfection thus creating a sleek, flawless accent. Warning: Choking Hazard This is a Marble - Keep away from children under 3 years of age. QUALITY: Royal Imports translucent glass pebbles are crafted of highest quality, pure and clear glass material. These stones are non- toxic and will not float in liquid. It is so clear, that a light will shine right through it. MULTIPLE USES: This pack of flat marble gems by Royal Imports is like a magic wand that transforms a simple arrangement into a dazzling masterpiece. It can be used as table scatters to decorate holiday dinners, birthday parties, bridal and baby showers, graduations, anniversaries, and seasonal events! It can also be used as vase fillers in wedding arrangements, bridal bouquets, Valentine's gifts, craft projects and so much more. 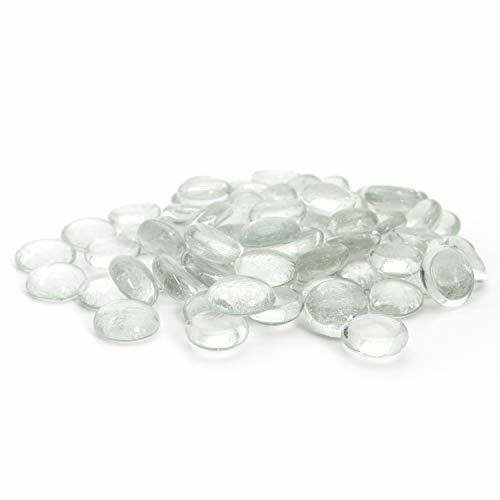 BEST SELLER: These attractive glass flat marbles are a best seller in the floral supply, home décor and wedding planning industry. It will add a whimsical touch to any event when used creatively. PACKAGING: These pebbles are packed approximately 400 pieces per 5 pound net bag and secured tightly so they arrive safely.